You do it yourself. Yes indeed, this is the bane of most self employed people, especially artists. We work in such different media that we can't just hire a guy off the street to do sections without it costing more time and energy than if we just did it ourselves. Plus, most people running their own company have a higher set of standards than someone who gets hired. Not saying there aren't extremely hard working hires out there, but there are also a lot that do just what it takes to do their job. They don't stay 4 hours late, don't take their work home, or think about new ways to make it better while they're showering. They don't work through their weekends, vacations, holidays.... Self-employed people work so much harder, longer hours to make their businesses successful. We don't "clock out". Ever. BJ and I recently put together an exhibition of our large glass works at the National Space Symposium, in their exhibition hall. We were alongside humongous companies like Northrop Grumman, Lockheed Martin, Moog, Orbital Sciences, and Boeing, just to name a few. And our little tiny art company. It's a standard practice that these exhibiting companies give away promotional gifts to the attendees, which is a struggle for us little companies, as we don't have the financial resources of Boeing. Most of the small companies give away pens, pencils, coasters, notepads, candy, etc. We wanted to give something that spoke to the uniqueness of our company, our art. 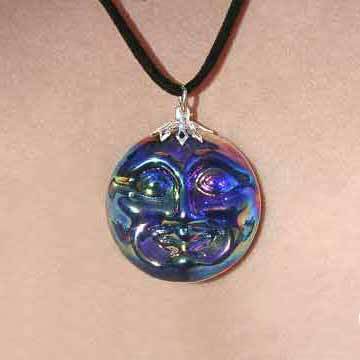 The past several years we've been creating and giving away small glass necklaces. 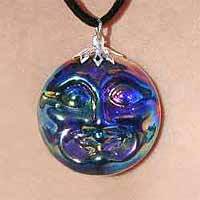 The first year it was little Moon faces on a leatherette cord, then the next year, a little Sun face pendant. This year I opted to make little 3 finned blown glass rocket ships. They took a bit longer to make than the others, but they would also be more memorable. Unfortunately, I ran out of time to make as many as I thought I needed; and the weather didn't cooperate. We lost power multiple times during severe storms. This is where I ran into trouble. The prior years, I made about 125 necklaces. This year, I made about 75 when I ran out of time. Instead of being short and running out of pieces way too early, we opted to hire another artist to finish the number that I needed. I showed him the best of the ones I had made so he could use that as a sample, but I couldn't stand there and oversee his work. When running a company, you have to trust your employees to do a good job. Sometimes they do, this time, he just didn't. Even knowing what the pieces would be used for, and that they would be handled, they were made supremely thin and fragile, and that meant that many of them broke soon after they were handed out at the conference. Yes, you could say, "well, they were getting them for free, so they should't look a gift horse in the mouth", but it's the perception of our company that I'm worried about; that we make, and are comfortable handing out, substandard pieces. We are not. And as I started seeing the problems with the set of rocket ships that were made by this other artist, I started kicking myself. I should have just not handed them out at all, even if I ran out early. And it was startling to me that he would have given me those, seeing that some were cracked and not up to what I showed as my example. I had to throw many of them away; the ones I saw had problems at the start. Why would someone turn in work that was such a low quality? It baffled me, and embarrassed me for the ones that were handed out. But the worst thing is that it once again makes me not want to hire anyone to delegate some of my work to. I'm again extremely distrustful that a hired hand will do a good job for me. I'm not asking them to work overtime, to give up their weekends, vacations, holidays to support my business, but I do ask that they do a good job with what they were hired to do. Is that really asking so much?